With the beginning of a new year right around the corner, people are beginning to set their New Year’s Resolutions. This is the perfect time to make some small changes in your financial habits that will, hopefully, make a big difference in the future. Here are a few simple ideas to help you get started. Maybe it’s that long awaited family vacation, beginning a college fund for your child, or starting the road to retirement. 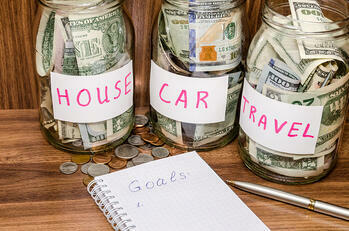 Whatever your financial goals for the year are, it’s important to make sure you know exactly what they are. Write down your goal and place it somewhere you’ll see it often. Remind yourself of what you’re aiming for when the urge for that spontaneous purchase hits. Always make sure that your goal is something realistic, even if it’s going to take a few years. Now that you have a goal set, how are you going to achieve it? The best way to control where your money is going is to create a budget. Write down everything that you spend during an average month and see if there are places where you can cut back a little. Then, use those amounts to set a limit for each expense during the month. This doesn't need to be a complicated system, it can be as simple as a note in your phone. If your needs change, you can adjust your monthly budget accordingly. Take away the hassle of remembering to pay your bills with automatic pay. This will help eliminate late fees, giving you extra cash to set aside. You can even set up your Cyprus Credit Union Mobile Banking App to remind you when a bill has been paid; just as a friendly reminder that the money is no longer there and preventing possible account overdraw. Each month, set a little money aside for emergencies. This could be car problems, medical issues, or even an unexpected job loss. Ideally, this fund should have enough money to take care of you and your family for 3-5 months, at least. This may seem like a lot, but it’s better to have the money already set aside, as opposed to taking out loans or maxing out credit cards just to make ends meet. Although April seems far away, due dates have a tendency to sneak up on you. Filing your taxes last minute may not only result in mistakes that could cost you, but you could also face potential late fees. By finalizing all of your information early, you’ll be able to see how much money you owe, if any, and begin saving before officially filing in April. Less people file earlier in the year, so you will most likely receive your refund check in a shorter amount of time as opposed to filing in April. It’s also one less thing you’ll have to worry about, so why not get it done. Yes, we know, a new year’s resolution to stay healthy, how original. But getting into shape will not only help you feel and look better, it can also help your bank account. Beginning a healthy lifestyle; including exercising regularly, wearing your seatbelt, and quitting smoking, can help decrease your healthcare costs. It may also help reduce your health insurance premium. Additionally, check with your employer’s human resources department and see if there are any healthy lifestyle incentives available.